The Web Offset Folder Knife penetrates the Cutting Stick at the end of its cutting stroke. This results in a clean, precise cut at the high speed required the cutting and folding unit. Plain Square sections range from 10×10 to 22×22 mm. 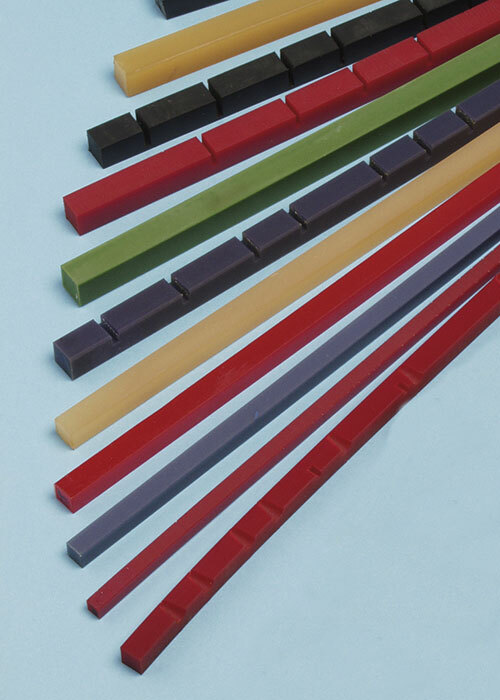 Hardness range 80A to 85A Shore – standard in red colour. Hardness range 90A to 95A Shore – standard in black colour. Natural resin colour available on request. Manufactured durable cast polyurethane which gives high resistance to the cutting knife. Precision engineered with low size tolerances to maximize life and ensure good fitting. Length tolerance – minus 0mm, plus 5mm. Cross section – plus 0.15 mm on nominal size. Standard length 610mm. Lengths below 610 mm can be cut on request. Engineered chamfers, holes, slots and grooves are available to suit the application. Special sizes and other hardnesses are available upon request. “Vulkolan” quality for ultra high cutting resistance available upon request.